Hello! Today's card uses another new Cocoa digi being released on the 1st from Sweet 'n Sassy Stamps! I colored with my copics an attempted to draw some grass....I need more practice! But overall I'm happy with my card, I think it will make a great masculine Birthday or even Father's Day card. Thanks for stopping by! Cocoa is just adorable! He is so versatile and makes every card so cute (with your help)! I love it, this is so darn adorable!!!! Cute cute cute....love this one! Me thinks we need a Cocoa behind a shoe for Cross Country...what do ya think??? Oh another sweet cocoa card! This one is wonderful...I just ordered this digi and can't wait to make a card with him. Thanks for joining us at PIO this week. Such a sweet little mouse. 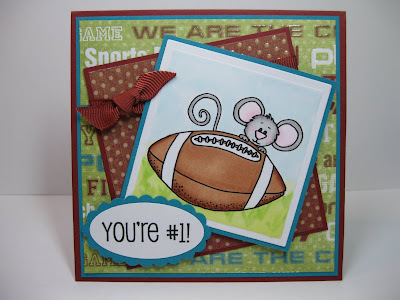 Too cute that its peeking from behind the ol' pigskin. Great card!